As many backwoods hikers know, a mother bear or moose is not an animal to be reckoned with. Motherhood sparks aggression in many species--bear, moose, as well as rats, mice, and dogs. Even most human moms would vow to defend their children no matter what. A recent study in mice suggests that the brain chemical nitric oxide (NO) plays a significant role in such maternal aggression. The groundwork for the study was laid four years ago, when Hopkins neuroendocrinologist Randy Nelson, teaming up with Hopkins neuroscientist Solomon Snyder, deleted a vital portion of a gene involved in the production of nitric oxide. Male "knockout" mice, the researchers found, were many times more aggressive than their genetic cousins in the control group, although they differed genetically by only one gene. Thus, nitric oxide appeared to dampen aggression. Female knockout mice behaved no differently than their normal genetic counterparts, but that was not surprising: While male mice are uniformly aggressive, females generally become aggressive only as mothers. So recently postdoc Stephen Gammie, along with Nelson, decided to measure maternal aggression in the knockout and control group of female mice. They placed into the cage of each mother mouse a male mouse she had never seen before. The male and female remained together for 10 minutes while the researchers counted the number of aggressive acts the mother showed toward the male: tail brandishing, baring teeth, lunging toward him. As expected, female mice in the control group were avidly aggressive. But the experimental mice--which lacked the ability to produce NO--barely raised a paw to fend off their intruders. The current study appears in the September 15 Journal of Neuroscience. "While nitric oxide puts the brakes on aggression in males, it facilitates aggression in females," concludes Nelson. How could the same neurotransmitter affect diametrically opposite behaviors? An explanation could lie in differences in the brain circuitry of male and female mice, suggests Gammie. While that circuitry will take some time to decipher, the researchers already know one place to begin looking. In a second part of their study, Gammie and Nelson used a staining technique that indirectly reveals cells in the brain that are producing NO. In female mice that had recently exhibited aggression, the results showed a surge of NO in the vicinity of a brain region called the paraventricular nucleus, or PVN. In contrast, they found no increase in NO in the brains of male mice. In people, the PVN is involved in integrating a number of different functions; it plays a role in the stress response and in the release of milk during lactation, says Gammie. In other studies, researchers found that lesioning the PVN of rats disrupted maternal aggression. Conventional lectures may not be the most effective way to teach intro-level science courses, according to a study by Hopkins researchers Harry Goldberg and Guy McKhann, published in the Journal of the American Physiological Society. The researchers divided Hopkins undergrads taking Topics in Neuroscience into two groups: The first attended a traditional lecture hall once a week; the second took the course, in which the same lecturer presented the same material, at their computers via a hybrid CD-ROM/Internet system. Weekly exam scores for students who took the computer-based course were on average 5 points higher, the researchers reported. The "density" of the virtual content may help explain the higher scores, Goldberg says. A split screen allows students to view animations of complex processes being discussed by the lecturer; type notes and add bookmarks to an electronic notebook; access a written transcript of the lecture; "query" the system using frequently asked questions; and slow down, speed up, or replay portions of the lecture as needed. Goldberg believes that virtual intro courses could improve faculty/student interaction, by allowing more time for discussing higher level material in smaller, seminar-style discussion groups. It was envy that launched Cila Herman into space--or her first 30 seconds of near-zero gravity, at least. Herman, a Hopkins associate professor of mechanical engineering, was a PhD student at the Technical University of Munich in the early '90s when she watched a professor and his colleagues jet off to NASA in the United States to do experiments that would end up in space. "They would come back with photographs, and I thought this is what I want to do when I grow up," Herman says, still wistful. In October, Herman's feet finally left the ground and spun to the ceiling of NASA's KC-135A turbojet transport. Herman had won NASA funding to test the behavior of bubbles in the "zero-g" environment created by the NASA jet's parabolic arcs--30 to 40 roller coaster peaks per two- and-a-half-hour flight. The craft, officially "The Weightless Wonder," is also known as the Vomit Comet. "I was perfectly fine most of the time. Two times I got sick for a minute," Herman says, noting that her graduate students were not so lucky during the flights. "The first day, we didn't film too many bubbles," she adds. The research group planned another flight in January. 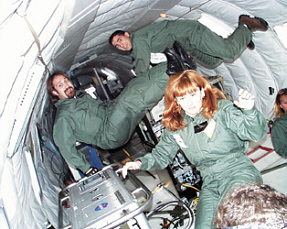 Herman and graduate students Gorkem Suner and Steven Marra were testing how bubbles behave in near-zero gravity when an electric field is applied, replicating similar experiments done by Herman in her Homewood lab. The project, which drew additional sponsors, was based at NASA's John H. Glenn Research Center in Cleveland. Herman also earned funding through a 1997 Presidential Early Career Award. Bubbles are a critical issue in space flight because in microgravity they tend to behave abnormally. Instead of floating off, they hang around their point of entry growing bigger and bigger. This phenomenon, known as coalescence, can create problems in fuel lines and other systems, and even in the digestive tracts of astronauts (who have trouble burping). Perhaps more critical, this behavior impedes effective boiling in space. Boiling, which creates bubbles that carry heat away from a surface, is one of the most efficient means of heat transfer, and thus cooling. Currently, various cooling methods are used in spacecraft, including the blowing of air over heated surfaces. Such methods, however, can be limited and problematic. A solution to the bubble dilemma in space, therefore, could lead to better ways to cool increasingly complex computer equipment, power generators, and life support systems--especially in extended periods of microgravity, such as manned flights to Mars. In her Homewood lab, Herman had previously shown that an electric field can cause bubbles to break up. As she explains it, an electric field generates a force similar to gravity that moves the bubbles in various directions. To conduct tests in the NASA jet, her team built a transparent cube and filled it with an electrically insulating fluid. Then they inserted a 25,000-volt electrode and a ground electrode, and injected air into the chamber. Using high-speed video, they recorded the bubbles' movements. The video shows that when the electric field was turned on, the bubbles broke up and moved away from one another, more like they do within Earth's gravitational environment--behavior that would allow heat transfer. The government-issue folding chairs and tables were a far cry from the crystal chandeliers and velvet brocade of Vegas. But then, researcher Bert Vogelstein isn't exactly Elvis. Still, he and the other members of the Hopkins-born rock 'n' roll band Wild Type were thrilled to garner first place at the Battle of the Bands, sponsored by the National Institutes of Health in October. Wild Type beat out The Directors, a folk-oldies band composed of the leaders of several arms of the NIH. And although the contest was judged by NIH employees, including director Harold Varmus, Wild Type was the clear favorite, says lead guitarist Pat Morin. In addition to Morin and Vogelstein, who plays keyboards, the band's members are Ellie Carson-Walter, lead vocals; Chris Torrance, guitar and vocals; Bob Casero, bass guitar; and Ken Kinzler, drums. Like most homespun rock 'n' roll artists, they all have day jobs, which, in this case, happen to be finding the cause of cancer. The band's inception dates back to 1995 when Morin and a few other members of the Vogelstein lab began trying out their musical talents at local karaoke bars. One thing led to another and soon a dozen of the scientists began holding jam sessions. Eventually only the diehards stayed on. They chose the name Wild Type, the geneticist's term for "not mutated." I wrote myself a grant. I sent it on down. Whether I'm gonna stick around.